The Northern Pacific Railroad approached the Duluth and Superior area from the west following two different paths. Their home base was in Brainerd. The mainline from Brainerd passed south of the Mississippi River, passed through Aitkin, then turned to the east and passing through Carlton and Thompson before entering the west end of Duluth. The other line headed north out of Saint Paul, passing through White Bear Lake, Forest Lake, North Branch, Hinckley, Moose Lake, and joining the mainline from Brainerd near Carlton. While these rail lines provided access to Duluth, they did not provide the Northern Pacific with a route to the docks in Duluth. 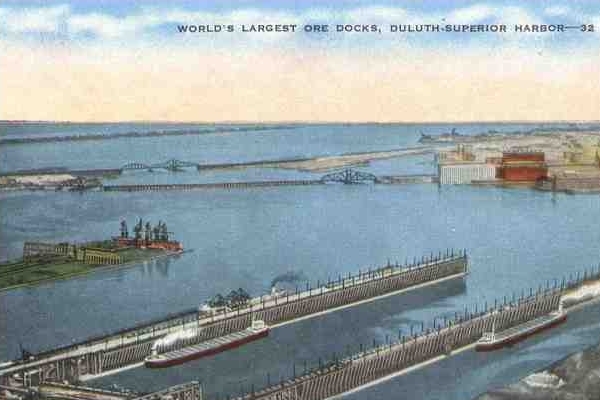 As iron ore became a major industry, the Northern Pacific built a large ore dock on the south end of Superior near the Superior Entry channel out to Lake Superior. The route to this dock branched off of the mainline at Carlton, looped south of the Saint Louis River, crossed into Wisconsin, and headed northeast directly to the ore dock. These rail lines gave the Northern pacific access to both Duluth and Superior, but did not allow trains to easily cross between the two sides of the harbor. To solve this problem, the Northern Pacific built two bridges across the Saint Louis River. The first is the Grassy Point Drawbridge. It crosses the river and bay directly east and west near to the present day US-2 Bong Bridge. The swing span for the Grassy Point Drawbridge is visible next to the Bong Bridge when heading southbound on US-2. The other bridge across Saint Louis Bay was built very near to the US-53 Blatnik Bridge. However, the Great Northern Railroad was there first, and they picked the best location across Saint Louis Bay between Connors Point and Rices Point. The Northern Pacific had to make do with a less ideal location to cross Saint Louis Bay. The route that was selected exited Superior to the north along the grain elevators that are visible to the west of the Blatnik Bridge. These are the present day Burlington Northern Santa Fe grain elevators. 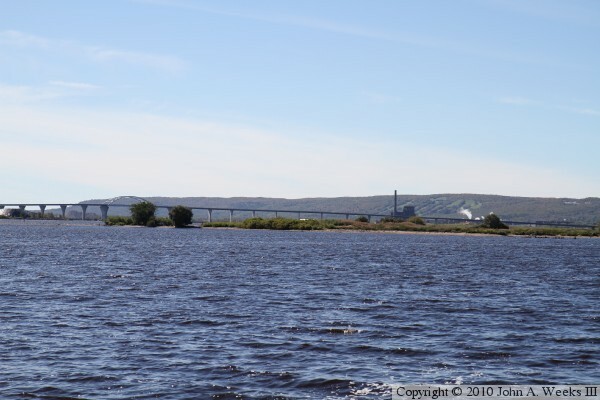 The bridge exited Duluth from the railroad yard on the east side of Rices Point. This is the rail yard that is just east of I-535 on the north end of the Blatnik Bridge. There is a significant problem with this path across the bay, and that is that it crosses two different navigation channels. 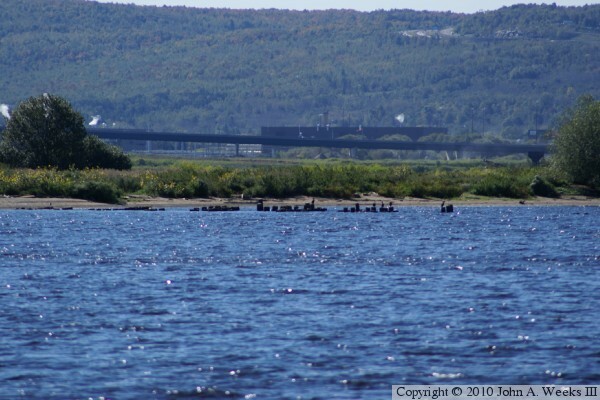 The north channel provides access to docks on the Duluth side of the bay, including the massive Duluth, Missabe, and Iron Range ore docks. The south channel provides access to the docks on the north side of Superior, including the grain docks and the former Soo Line ore docks. The net result is that this crossing of the Saint Louis Bay would require two main channel spans. Since this is a railroad bridge, a tall span is not an option. That would mean building lift spans or swing spans. Swing spans were more common at the time. Two spans would mean twice the complexity, twice as much machinery, and two bridge operators. The Saint Louis Bay bridge was built as a double-track structure. It left Rices Point heading southwest. It crossed a short truss span, then crossed the swing span over the north navigation channel. This swing span was known as the Minnesota Draw. The bridge then crossed a low trestle, turning due south and running along a small island in the bay that is commonly referred to as Bird Island. The trestle passed the island, crossed the south navigation channel on a swing span, then landed on the east side of a man-made peninsula that was built for a large grain elevator. The southern swing span was known as the Wisconsin Draw. I estimate that the bridge was 3,400 feet over water, plus another 1,200 feet on the peninsula. The beginning of the end of the Saint Louis Bay bridge happened with the 1970 merger of the Great Northern, Northern Pacific, and the Chicago, Burlington, and Quincy to form the Burlington Northern Railroad. Ore traffic had dropped and the rail yards on Rices Point and along downtown Duluth had lost their importance. The Great Northern had already abandoned the Interstate Bridge in 1962. The BN still had two bridges over the harbor. 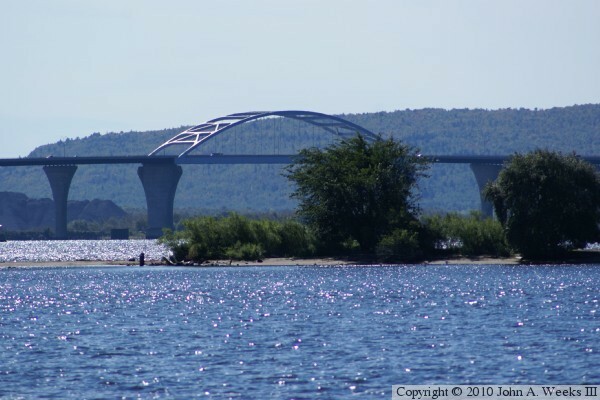 Since the Saint Louis Bay Bridge sat in an awkward location and was expensive to operate, the BN decided to focus on the Grassy Point Bridge. There are no visible remains of the Saint Louis Bay bridge. The land on the Duluth end is currently in use by a sand and gravel operation. Harbor navigation maps do warn of submerged bridge ruins along the path of the trestle. Since the bridge was removed, the navigation channels have been dredged to make them wider and deeper. The bridge was reported to have been removed in the summer of 1986. I moved to Duluth for College in June of 1987, and I recall that it was still standing at that time. I don't recall specifically when it disappeared. I also have not learned when it was built or when it was abandoned. I would appreciate it very much if someone could help me fill in these details, and perhaps provide a photo of the bridge. The photo above is a postcard from the first half of the 20th century. This image started as a drawing or painting rather than a photograph. As a result, it is an artist impression of the scene rather than being a photographic documentation of the scene. The view is looking southeast from the top of the bluffs in West Duluth. The DM&IR ore docks are in the foreground. 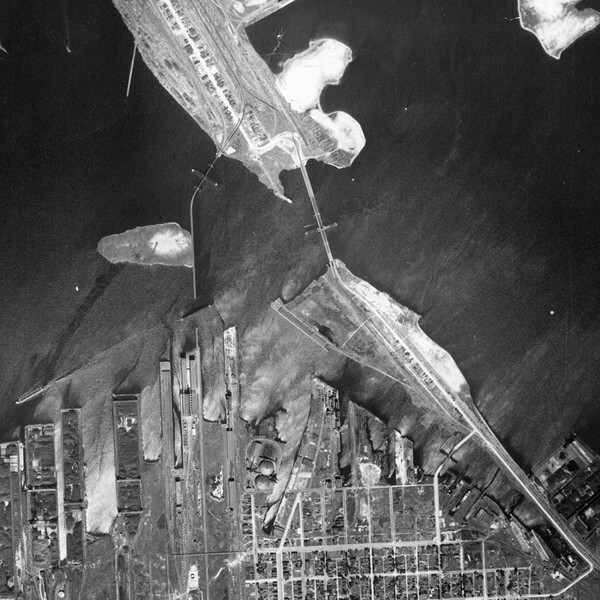 The grain elevators on the Superior side are on the top right, while the shipyards and Minnesota Point are on the top left. The Saint Louis Bay Bridge connects between Rices Point in Duluth to the grain elevator area on the Superior side of the bay. The Minnesota Draw swingspan is on the left, but is a little hard to spot in the image. The Wisconsin Draw swingspan is on the right. The swing bridge behind the Saint Louis Bay Bridge is the Great Northern Interstate Bridge. 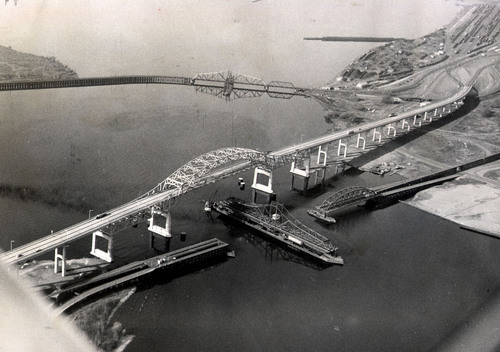 The photo above is an aerial view of the main span of the I-535 Blatnik bridge over the Duluth and Superior harbor. The bridge in front of the highway bridge is the Great Northern Railroad Interstate Bridge. This was a combination railroad and highway bridge. It was closed and removed a few years after the I-535 bridge opened. The bridge in the background is the northern half of the Saint Louis Bay Bridge. The Minnesota Draw swingspan and a short section of truss bridge is located at the far north end of this structure. The Minnesota Draw provided access to the inner section of the Duluth harbor. This photo was clipped from the program for the dedication ceremony for the new I-535 Blatnik Bridge over the harbor connecting Duluth (on the near side) to Superior (on the far side). The Great Northern Interstate Bridge is located just to the left of the Blatnik Bridge. The Northern Pacific Saint Louis Bay Bridge is located on the right side of the photo. The Minnesota Draw swingspan is located in the foreground, while the Wisconsin Draw swingspan is located at the far right edge of the photograph. The image below is clipped from the Minnesota state DNR aerial photo database. 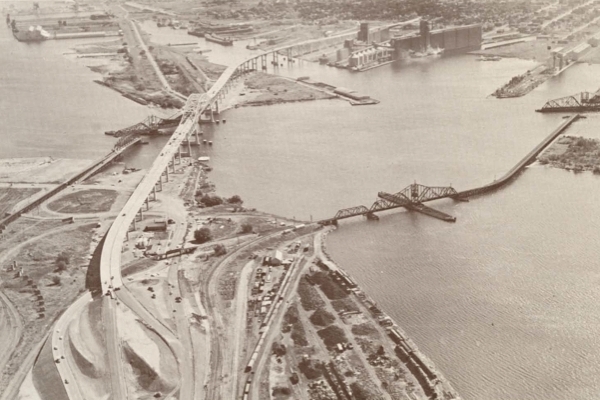 This 1940s view shows the Saint Louis Bay Bridge on the left, and the Interstate Bridge on the right. Rices Point in Duluth is the landmass on the north side of the photo, while Superior is on the south side of the photo. The Minnesota Draw is the upper swing bridge of the Saint Louis Bay Bridge, while the lower bridge, the Wisconsin Draw, is currently in the open position. 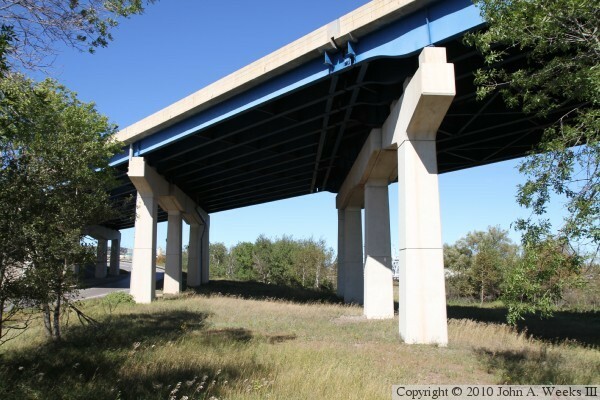 The photo above is the location of the north abutment of the Saint Louis Bay Bridge. The vantage point is looking north from a fishing pier located under and just to the west of the Blatnik Bridge. 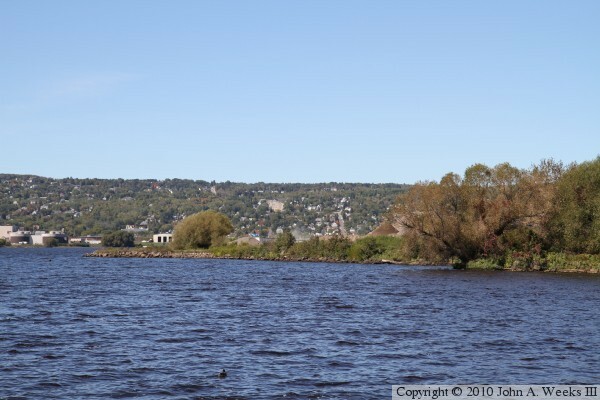 The city of Duluth is in the background. The photo below is looking west from the same location towards a small island in the harbor. The Saint Louis Bay Bridge ran along the near side of this island, with the Minnesota Draw being off the right side of the photo, and the Wisconsin Draw being located on the left side of the photo. The photo above is a close view of the area on the northeast side of this island in the harbor. 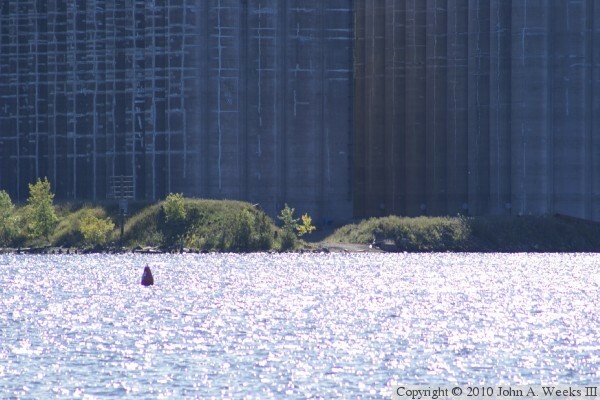 The pilings once supported the approach trestle leading to the Minnesota Draw swing span. The photo below is the south side of the island, with the Bong Bridge visible in the background. A few pilings are visible above the waterline. These pilings supported the trestle leading to the Wisconsin Draw swing span. 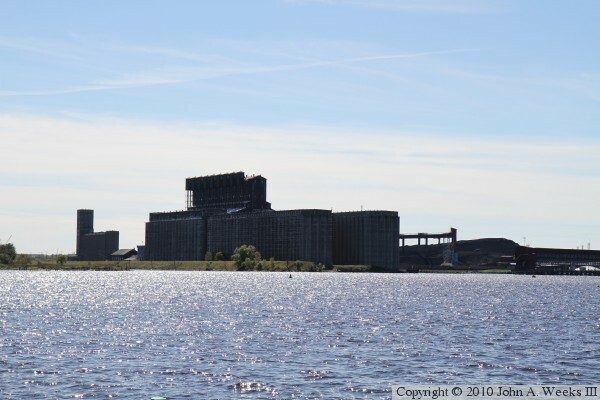 The photo above is looking southeast from same location towards the General Mills grain elevator complex on the Superior side of the Twin Ports Harbor. This photo is looking into the mid-afternoon sun. These elevators were built by the Great Northern Railroad, and are now owned by the BNSF Railroad, but are leased to General Mills. The complex can store 12-million bushels of grain. The Saint Louis Bay Bridge ran on a earthen embankment on the near side of the elevator complex. The photo below is a close view of the north end of the embankment. It appears that the bridge abutment is still in place, as well as some pilings visible both on the embankment and in the water. 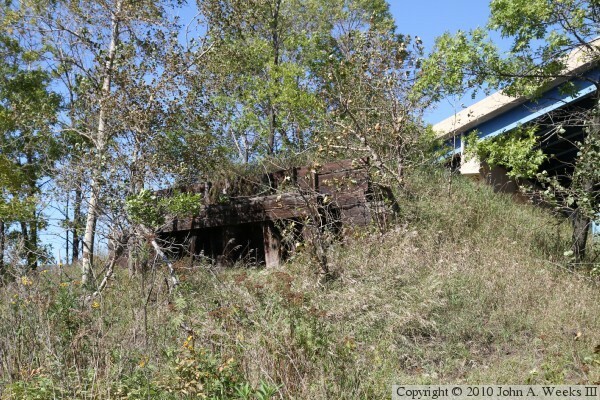 The photo above is a mound of earth located between the Blatnik Bridge and Garfield Avenue on the Duluth side of the harbor channel. The photo below is looking northeast from this mound of earth. It is apparent that the railroad track leading to the Saint Louis Bay Bridge once passed between these bridge piers given that the piers are set at an angle to the roadway. In fact, the location of the rail line and its elevation dictated where the north abutment of the Blatnik Bridge was located. 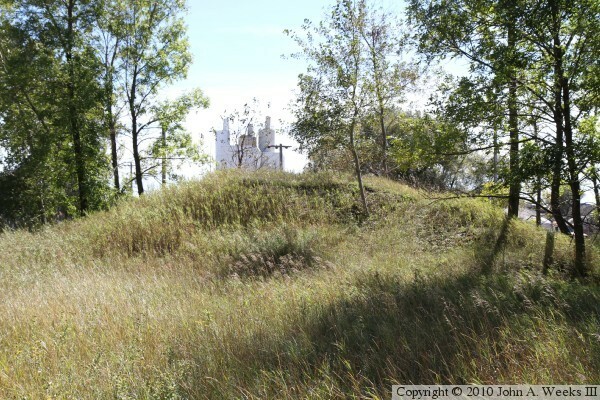 These two photos are views of the Garfield Avenue side of the earthen mound shown above. 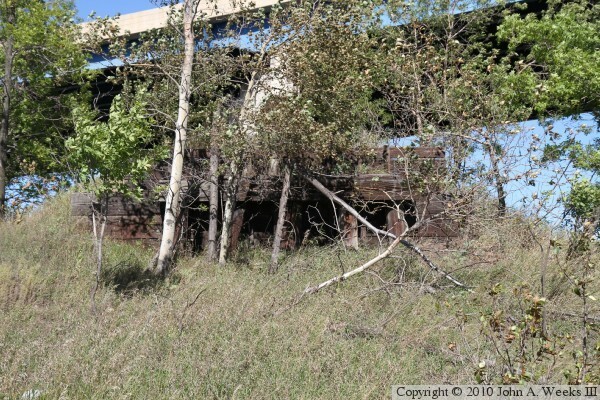 These photos show that this was once a bridge abutment, and the mound is the remains of the embankment leading to the north end of the Saint Louis Bay Bridge. This rail bridge crossed Garfield Avenue, then followed a very short segment of embankment, which in turn supported the north abutment of the bay bridge.